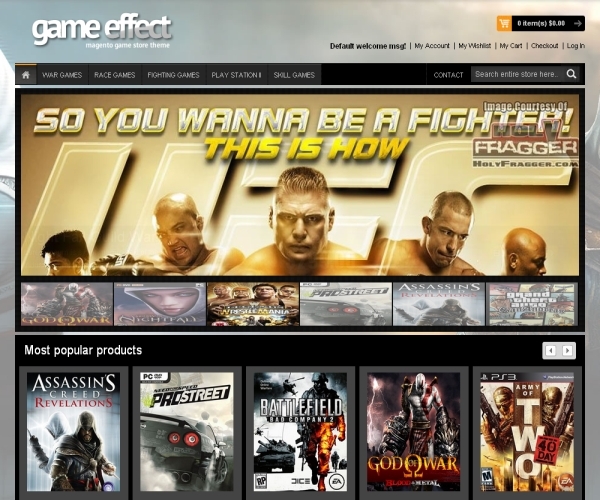 Game Effect is one of the best premium Magento themes for online game stores. It comes with support for multiple languages and currency options along with an attractive design scheme in tune with your products. Multiple image sliders helps you easily organize a slideshow of your featured product ranges, new arrivals, deals, promotions etc. The homepage comes in an attractive design scheme that includes a custom background along with an image slider for your latest games, deals, promotions etc. Two more single row scrollers in the homepage allow you to include your different product ranges, popular products etc. The footer block is widget ready and includes an opt-in box for newsletter subscription as well as embedded social media links. The digital download file links after a purchase would show in the user’s dashboard from which they can be downloaded. The theme allows users to register with the site and create a user account that gives them a custom dashboard to manage their account, orders, downloads etc. Primary navigation is by a multi-level header menu. The theme has a separate top header menu for account management links and allows you to include quick links in the footer space. Within internal category pages, users can choose between a grid or a list layout option and can sort listings and can also select the number of products to be displayed per page. Internal product pages come with support for multiple images and a magnification scroller enabling users to see a magnified version of the on-screen image. Also included is a provision to add reviews and product tags. Registered users can add reviews, compare products and can manage a custom wishlist. The theme requires Magento community edition version 1.5 and higher and is cross-browser compatible. Its lightweight and SEO friendly. The “Game Effect” premium Magento theme is priced at $49.